One of the key pieces of advice for SaaS startups (actually all startups really but in this case of particular relevance to SaaS0 is to measure everything. Over the last few years a number of different solutions have been developed which allow companies to measure different parts of their business – Google Analysics, NewRelic and others help to drive insights into different parts of the SaaS operation. And interesting area for development is around user engagement and this is the space within which Totango operates. Totango is a really interesting company that touts itself as a “customer engagement management” platform for online businesses – essentially Totango tracks user interaction with the application to give vendors real insights into usage, adoption, conversion and retention of the product. I’m involved with a few SaaS businesses and one of them, Connect2Field, has deployed Totango to gain some really powerful insights into customer activity. 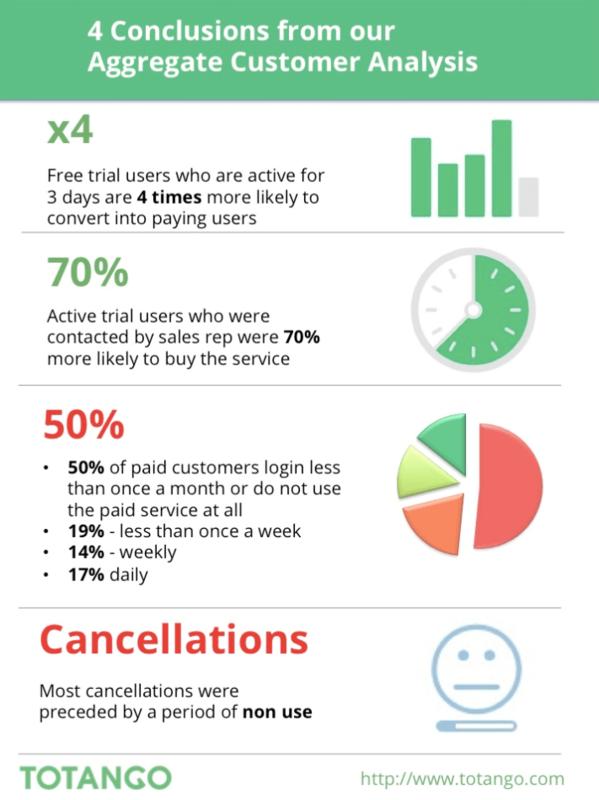 Free trial users who were still active on day three of their trial were four times more likely to convert into paying users than the average customer. Takeaway – vendors need to think about creating continuing engagement over several days, they need to develop strategies to take trial users on a journey with small, incremental moves each day. Most cancellations were preceded by a period of non-use. It’s imperative for conversion teams to be aware of trial customers whose usage drops off after a period of time – they should proactively reach out to these customers to encourage further engagement. Obviously these findings and suggestions are fairly low-level, but offerings like Totango, alongside flexible subscription and billing platforms, start to see the industry really deliver deep flexibility and tracking across revenue lifecycle management (RLM). While CRM tends to be focused on sales opportunities and deal flow, I’m sensing that as we move to the subscription economy, we’ll see much more holistic ways of looking at customers that tracks their entire relationship from trial, to purchase, to upgrade, to renewal. Insights like those from Totango help to deliver on that opportunity.